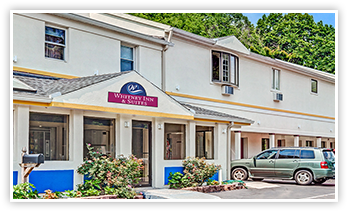 You can easily reach many Connecticut attractions as well as a number of colleges and universities when you stay at Whitney Inn & Suites hotel off Interstate 91 near Quinnipiac University. Our many free amenities include free continental breakfast, free Wi-Fi Internet access and free parking. Make use of your in-room refrigerator and microwave or stay in one of our new oversized, executive rooms, complete with flat screen TV. Kids 17 and under stay free with an adult at our Hamden CT hotel. Enjoy fine Italian dining paired with excellent wine at Ristorante Luce, or play pool, sing karaoke, catch TV sports action or listen to a live band as you enjoy delicious food at Whitney Bar & Grill, just a half mile from our hotel in Hamden, CT. Enjoy authentic Indian fare at Cumin India, or head to Louis’s Lunch, touted as the Birthplace of the Hamburger. Try Eli’s on Whitney for sophisticated American fare, Kumo Japanese Restaurant for Asian flavors, or if you are in the mood for tasty pizza, Pepe’s Pizza is also close by.